The heat content of the oceans is growing and growing. That means that the greenhouse effect has not taken a pause and the cold sun is not noticeably slowing global warming. The amount of heat stored in the oceans is one of the most important diagnostics for global warming, because about 90% of the additional heat is stored there (you can read more about this in the last IPCC report from 2007). The atmosphere stores only about 2% because of its small heat capacity. The surface (including the continental ice masses) can only absorb heat slowly because it is a poor heat conductor. Thus, heat absorbed by the oceans accounts for almost all of the planet’s radiative imbalance. If the oceans are warming up, this implies that the Earth must absorb more solar energy than it emits longwave radiation into space. This is the only possible heat source. That’s simply the first law of thermodynamics, conservation of energy. This conservation law is why physicists are so interested in looking at the energy balance of anything. Because we understand the energy balance of our Earth, we also know that global warming is caused by greenhouse gases – which have caused the largest imbalance in the radiative energy budget over the last century. If the greenhouse effect (that checks the exit of longwave radiation from Earth into space) or the amount of absorbed sunlight diminished, one would see a slowing in the heat uptake of the oceans. The measurements show that this is not the case. 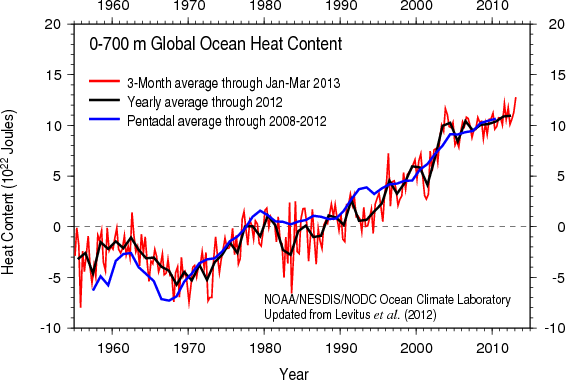 The increase in the amount of heat in the oceans amounts to 17 x 1022 Joules over the last 30 years. That is so much energy it is equivalent to exploding a Hiroshima bomb every second in the ocean for thirty years. The data in the graphs comes from the World Ocean Database. Wikipedia has a fine overview of this database. The data set includes nine million measured temperature profiles from all of the world’s oceans. One of my personal heroes, the oceanographer Syd Levitus, has dedicated much of his life to making these oceanographic data freely available to everyone. During the Cold war that even landed him in a Russian jail for espionage for a while, as he was visiting Russia on his quest for oceanographic data (he once told me of that adventure over breakfast in a Beijing hotel). Ideologically motivated “climate skeptics” know that these data contradict their claims, and respond … by rejecting the measurements. Millions of stations are dismissed as “negligible” – the work of generations of oceanographers vanish with a journalist’s stroke of a pen because what should not exist, cannot be. “Climate skeptics’” web sites even claim that the measurement uncertainty in the average of 3000 Argo probes is the same as that from each individual one. Thus not only are the results of climate research called into question, but even the elementary rules of uncertainty calculus that every science student learns in their first semester. Anything goes when you have to deny global warming. Even more bizarre is the Star Trek argument – but let me save that for later. We see two very interesting things. 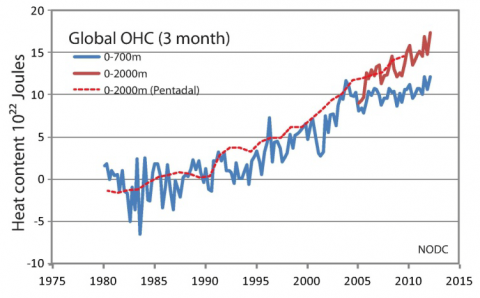 First: Roughly two thirds of the warming since 1980 occurred in the upper ocean. The heat content of the upper layer has gone up twice as much as in the lower layer (700 – 2000 m). The average temperature of the upper layer has increased more than three times as much as the lower (because the upper layer is only 700 m thick, and the lower one 1300 m). That is not surprising, as after all the ocean is heated from above and it takes time for the heat to penetrate deeper. Second: In the last ten years the upper layer has warmed more slowly than before. In spite of this the temperature still is changing as rapidly there as in the lower layer. This recent slower warming in the upper ocean is closely related to the slower warming of the global surface temperature, because the temperature of the overlaying atmosphere is strongly coupled to the temperature of the ocean surface. That the heat absorption of the ocean as a whole (at least to 2000 m) has not significantly slowed makes it clear that the reduced warming of the upper layer is not (at least not much) due to decreasing heating from above, but rather mostly due to greater heat loss to lower down: through the 700 m level, from the upper to the lower layer. (The transition from solar maximum to solar minimum probably also contributed a small part as planetary heat absorption decreased by about 15%, Abraham, et al., 2013). It is difficult to establish the exact mechanism for this stronger heat flux to deeper water, given the diverse internal variability in the oceans. Global surface temperature (average of the three series from NOAA, NASA and HadCRU). Years influenced by El Niño are shown in red, La Niña influenced years in blue. Source: Climate Central, updated figure from the World Meteorological Organization (WMO) p. 15. One finds that both the red El Niño years and the blue La Niña years are getting warmer, but given that we have lately experienced a cluster of La Niña years the overall warming trend over the last ten years is slower. This can be thought of as the “noise” associated with natural variability, not a change in the “signal” of global warming (as discussed many times before here at RealClimate). This is consistent with the finding that reduced warming is not mainly a result of a change in radiation balance but due to oceanic heat storage. During La Niña events (with cold ocean surface) the ocean absorbs additional heat that it releases during El Niño events (when the ocean surface is warm). The next El Niño event (whenever it comes – that is a stochastic process) is likely to produce a new global mean temperature record (as happened in 2010). The reason for the change is a specific change in the winds, especially in the subtropical Pacific, where the trade winds have become noticeably stronger. That altered ocean currents, strengthening the subtropical sea water circulation thus providing a mechanism to transport heat into the deeper ocean. This is related to the decadal weather pattern in the Pacific associated with the La Niña phase of the El Niño phenomenon. Our results show that the current hiatus is part of natural climate variability tied specifically to a La Niña like decadal cooling. They show this with an elegant experiment, in which they “force” their global climate model to follow the observed history of sea surface temperatures in the eastern tropical Pacific. With this trick the model is made to replay the actual sequence of El Niño and La Niña events found in the real world, rather than producing its own events by chance. 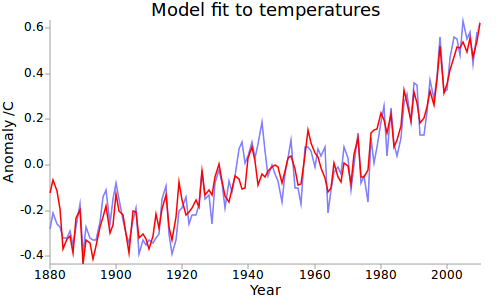 The result is that the model then also reproduces the observed global average temperature history with great accuracy. 1. Our correlation analysis between global temperature and the El Niño Index. 2. The measurements of oceanic heat uptake. 3. The new model calculation of Kosaka and Xie. Winds can do a lot, but can they beam warm surface waters heated by carbon dioxide 700 meters further down? This argument reveals once again the shocking lack of understanding of basic physics in “climate skeptic” circles. First the alleged problem is lacking any factual basis – after all, in the last decades the upper layer of the oceans has warmed faster than the deeper (even if recently not quite as fast as before). What is the problem with the heat first warming the upper layer before it penetrates deeper? That is entirely as expected. Second, physically there is absolutely no problem for wind changes to cool the upper ocean at the same time as they warm the deeper layers. The following figure shows a simple example of how this can happen (there are also other possible mechanisms). The ocean is known to be thermally stratified, with a warm layer, some hundreds of meters thick, lying on top of a cold deep ocean (a). In the real world the transition is more gradual, not a sharp boundary as in the simplified diagram. 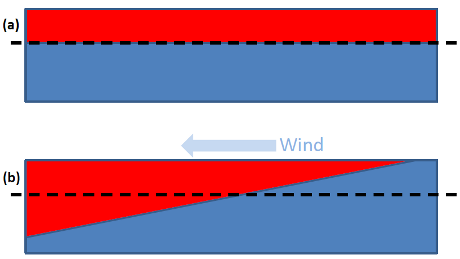 Panel (b) shows what happens if the wind is turned on. The surface layer (above the dashed depth level) becomes on average colder (less red), the deep layer warmer. The average temperature changes are not the same (because of the different thickness of the layers), but the changes in heat content are – what the upper layer loses in heat, the lower gains. The First Law of Thermodynamics sends greetings. Incidentally, that is the well-known mechanism of El Niño: (a) corresponds roughly to El Niño (with a warm eastern tropical Pacific) while (b) is like La Niña (cold eastern tropical Pacific). The winds are the trade winds. The figure greatly exaggerates the slope of the layer interface, because in reality the ocean is paper thin. Even a difference of 1000 m across the width of the Pacific (let’s say 10,000 km) leads to a slope of only 1:10,000 – which no one could distinguish from a perfectly horizontal line without massive vertical exaggeration. Now if during the transition from (a) to (b) the upper layer is heated by the greenhouse effect, its temperature could remain constant while that of the lower one warmed. Simple classical physics without beaming. Beam me up Scotty! There is no intelligent life on this planet. Tamino provides his usual detailed analysis of the new study by Kosaka and Xie. Dana Nuccitelli in the Guardian on the same paper with some further interesting aspects that I have not talked about here. Another important point that is often forgotten in the discussion: The data hole in the Arctic that explains part of the reduced warming trend (maybe even more than previously thought). And a reminder: The warming trend of the 15-year period up to 2006 was almost twice as fast as expected (0.3°C per decade, see Fig. 4 here), and (rightly) nobody cared. We published a paper in Science in 2007 where we noted this large trend, and as the first explanation for it we named “intrinsic variability within the climate system”. Which it turned out to be. Levitus et al. (Geophysical Research Letters 2012). 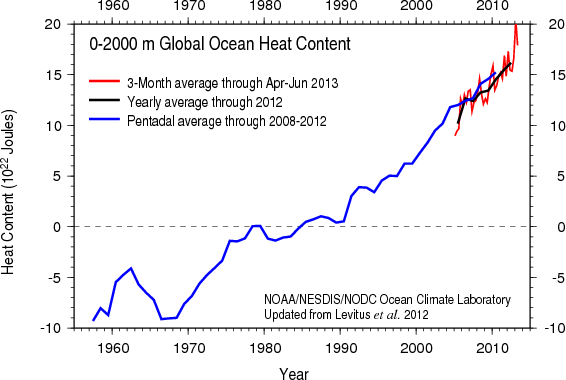 Documentation of the heat increase in the world’s oceans since 1955. Included are uncertainty analyses, maps of the measurement coverage and many illustrations of the regional and vertical distribution of the warming. Balmaseda et al. (Geophysical Research Letters 2013) shows among other things that El Niño events are associated with a strong loss of heat from the oceans. As discussed above, during an El Niño the ocean loses heat to the surface because the surface of the ocean (see Fig. (a) above) is unusually warm. Further, during volcanic eruptions the ocean cools but for another reason: because volcanic aerosols shade the sun and thus the oceans are heated less than normal. Guemas et al. (Nature Climate Change 2013) shows that the slower warming of the last ten years cannot be explained by a change in the radiative balance of our Earth, but rather by a change in the heat storage of the oceans, and that this can be at least partially reproduced by climate models, if one accounts for the natural fluctuations associated with El Niño in the initialization of the models. Abraham et al. (Reviews of Geophysics 2013). Very recent, wide ranging review of temperature measurements in the oceans with a detailed discussion of the accuracy of the data, planetary energy balance and the effect of the warming on sea levels. The solar energy will increase in the next 10 years, progressing to solar maximum. The chance to get an El Nino is also considerable high. This means that there will be very likely a new temperature record we can expect. At the same time the cryosphere response progresses to a more ice free state. Which further accelerates feedbacks. The problem is that we cannot just stop these processes, because of the big inertia of the climate system. That is why we need to fix the CO2 problem today, not when extremes disrupt society to a degree which makes actions harder and the chance to pass other tipping points. Hansen further explained how a +2C target is analog to the early Pliocene, which comes with 15-25 higher sea levels. We are now roughly at +1C. The media has to report this properly, with input from scientist – to accurately message the science to the public! We threaten the habitability of what we call home if we continue with inaction, if we continue with burning of fossil fuels! Thanks for this very helpful post. I have a question about one of your calculations. Am I right in thinking that a Hiroshima bomb is approx 67TJ of energy (or 67 x 10^12J)? That seems to be an often-quoted figure. If so, then 67TJ per second for 30 years is 67 x 60 x 60 x 24 x 365.24 x 30 = 63,429,039,360 TJ = ~6.3 x 10^22J. This links to an article in German. I think I could make out the gist of it, but perhaps you could give your synopsis. Is there a lot more warming of the Arctic Ocean than was previously thought? How large of a role has ocean warming been playing in the rapid loss of sea ice volume there? Thanks again for the article, and thank ahead of time for any further light you can through on the (now quickly darkening) Arctic. As we have typically expressed energy in the atmosphere on a degrees C scale, I thought this might be useful from the UK Met Office, for context. finding a rate <2oooths of a degree C per decade. (ref increase in 0.09C in 55 years) is that really measurable? Whoops, missing the huge 1982/83 El Niño… Shows up in the original versions of the figure. Thanks you for this. My executive summary is that the ocean as a whole is continuing to heat up at a constant rate, which suggests that heat being retained by the greenhouse effect has also been increasing at the same rate for the past 30 years. Some heat is being transferred to the deeper ocean by wind changes, reducing the rate of increase in the upper layer, which reduces the warming rate on land. As for changes in the solar cycle, is the following sentence correct? “The transition from solar maximum to solar minimum probably also contributed a small part as planetary heat absorption decreased by about 15%.” I assume you mean the change in the annual increase, rather than total planetary heat absorption. Thanks for this post Stefan. It is very timely given the “pause” the denialosphere is so intent on focusing on. We are at solar max now and we have been a while without an El Nino. This is a very timely article, given all the recent nonsense about no temperature increases in the last decade. The first graph shows how meaningless this claim is. However, I have a question about the use of the word “heat.” I’m sure that just about all climate scientists know the definition of the word, but, as in this article, I often see it used incorrectly. Talking about heat as contained somewhere makes it seem as if the discredited “caloric theory” is still the basis of thermodynamics. Since heat is now defined as “the transfer of energy between two systems as a result of a temperature difference,” heat itself is not a substance that can be stored. Energy is stored, the transfer of energy is not. Isn’t it time to use the interest in climate science to educate the public on the correct meaning of heat? Could someone translate 10^23 joules into degrees, for those of us afraid to slip a digit figuring the volume of the ocean? I think it is inaccurate to say “deeper than that(2000m) not much happens”. If you mean not much observing happens you are right. If you mean changes in ocean temperature, Purkey & Johnson 2010 have looked at that. Thanks James for pointing that out, took me a moment to find the current data on this. It is still popular nomenclature in physical oceanography and atmospheric dynamics to refer to the bodily transport of energy by a fluid as “heat transport.” Technically, heat is a quantity of exchange, not a property of the fluid, and the “transport” we speak of differs from heat fluxes (e.g., radiation)…see Warren, 1999 (JGR) for a more thorough examination of the terminology. Generally “enthalpy” is what is actually meant. But I agree with Gavin that this is not very important in the public discourse, and probably not even in the scientific literature. I don’t know of much confusion on what is being talked about that has stemmed from this. Wili @3: Load Stefan’s German-language post into Google Chrome. Chrome will ask if you want a translation. The translation isn’t perfect, but the main messages are there. In deutscher oder englischer Sprache, ist Stefan ein erstklassiges Klima Kommunikator. My question is: Is it getting close to when the SOI can be used to automatically remove the pseudo-oscillatory ocean noise? The SOI signal is stationary over decades as it shows very little trend. Another way to put it: how much residual noise would the GISS, HadCRUT, etc data sets have after compensating via the SOI record? Nice article. I am very interested in this subject and I am also learning German at the moment (since I am now working in Vienna). Are there any good websites like Real Climate that are only in German? I think one learns best when they read stuff that is interesting. Check before repeating that belief. You appear to predict Cycle 25 will peak in 2023, higher than Cycle 24 peaking this year. It’s possible. It’s interesting. But is this your own prediction? something you read somewhere? Why think so? I’m with Bob  — in spirit, anyway — on “heat.” Better term for this use would be thermal energy, but understand the need not to be too pedantic. Regarding the “pause” in surface warming. I’m not hearing much about aerosol screening as a result of massive buildup of coal-fired power plants in China and India. Given the significant role such aerosols played in the 40’s, 50’s, 60’s from U.S. and European emissions (prior to serious scrubbers), and that the scale in China / India right now is significantly larger, why wouldn’t this aerosol screening (global dimming) be an issue? If you google solar cycle all the images you get show solar minimum. If you go to wikipedia same, though i just fixed that. Nice and informative article, thanks! I have one question. In the section on links with ENSO, you write that the recent reduced warming rate of the upper 700m is related to natural variability, given the clustering of La Niñas in the last fifteen years. A valid point indeed, but are you confident that this is ‘natural variability’? Might it be speculated that a change in ENSO (more frequent La Niñas) is an aspect of global warming, rather than natural variability? I realize of course that this is conjecture, and other explanations such as e.g. stochastic behavior or modulation by other modes of variability are perhaps more likely to be correct. Stefan, I linked above to one comparison of CO2 vs. solar forcings (Schaller et al., doi:10.5194/esdd-4-393-2013). 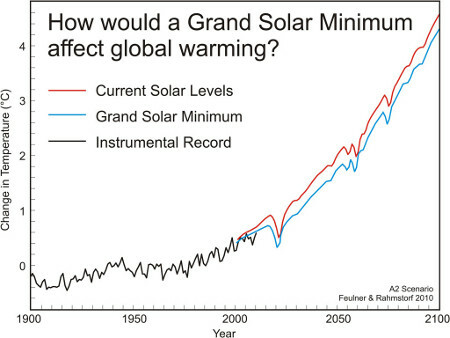 You point out in the main article that “the cold sun is not noticeably slowing global warming” pointing to the Guardian’s article and the graphic from Feulner & Rahmstorf (2010). Solanki’s earlier work was popular with the “It’s the Sun” crowd, but if I read that right, they’re saying variation of the Sun’s direct forcing is trivial, and those older studies were making too much of tiny changes. (I realize solar over time averages out to no trend, while CO2 forcing is steadily trending upward — I wonder if varying insolation changes wind patterns and intensities, to change ocean temperature/depth arrangement (and plankton blooms and clouds and albedo change as that happens). How do you explain the regional investigations: The UOHC ( 0…700m) of the northern extratropics: http://climexp.knmi.nl/data/inodc_heat700_0-360E_19-90N_n.png where we can see a decline after about 2005 and the southern extratropics: http://climexp.knmi.nl/data/inodc_heat700_0-360E_-90–19N_n.png where we find a strong increase of the UOHC? Is the heat on the road to the abyss only in the NH? What kind of “downward elevator” is working only in NH? Gavin or Stefan – The cited data suggest that the rate at which the Earth has been storing energy recently does not greatly exceed 0.30 W/m^2. Other OHC estimates have suggested a larger quantity. How are these data reconciled with estimates of the planetary energy imbalance from a variety of model sources that are closer to 1.0 w/m^2? This is of particular interest in relation to “effective climate sensitivity” estimates that rely heavily on OHC uptake data. Seconding Krishna AchutaRao at 25 Sep 2013 9:42 AM. Observations are sparse but still enough to yield statistically significant insights, pretty much all of which are disturbingly consistent with what’s going on up here in the daylight. To paraphrase the late Senator Dirksen, a few Sverdrups here and a Sverdrups there and pretty soon you’re talking more than small change. Follow Johnson et al into the depths! If this is 90% of the heating of the earth we would get around 0.5W/m2. Is this at the lower end of estimates? A fairly recent paper by Trenberth&Fasullo (Surv Geophys (2012) 33:413–426) quotes an estimate of 0.9W/m2 (+-0.4W/m2 if I remember correctly). Where are the paleo reconstructions for deep ocean temperatures? Seems that’s missing at the Wikipedia link. This is the most helpful article that I’ve read on the topic, demonstrating multiple lines of evidence. I think the part about differential warming of different layers of the ocean to be particularly clear and useful. Which implies that the mere average watts from global warming going back over the last 30 years is perhaps more than 10 times higher than the average watts from human productive use in the latest year of 2012. Global warming effects are accumulating, which gives great power to their results over time. While human production and use is year by year. But what a huge leverage factor that implies. ps — above Prokaryotes discovered the 2007 Tung paper. The rate of shallow ocean warming can decrease at the same time the rate of deep ocean warming increases. This can happen if something increases the amount of mixing between the (warm) shallow ocean and the (cold) deep ocean. The mixing transports heat from the shallow ocean to the deep ocean, thus cooling the shallow ocean while warming the deep ocean. Skeptical Science offers many posts translated into German, among other languages. Is this presentation wrong or right? It is of interest to know if Ocean heat Content is different in different oceans or parts thereof. @10: I think you’re confusing the verb ‘to heat’ with the noun ‘heat’. To heat something does require a transfer of heat energy from some source to whatever is heated. But heat itself is a form of energy– the energy of random molecular motion. Just curious, but you say “This is the only possible heat source.” Does not volcanism provide a source? The interior of the earth is a heat source, and there is poor understanding of the heat flux, its magnitude and how it varies over time. We continue to “discover” vast, active volcanoes in the deep oceans, could they not have an impact on ocean heat content and via that the atmospheric heat content? Some parts of the continental USA have a heat flux of the order of 10Wm-2, perhaps there are similar areas of high flux in the deep oceans? How bad can the next El Nino be? This year for example we had 45.8C in Sydney on January 18 in a ‘neutral’ year. If cities with pampered citizenry nudge 50C for several days in a row the same time as electricity and water problems there will be major grief. Sure Baghdad does this but I doubt they have the nearby fire prone bushland or the high percentage of senior citizens as Sydney. Is there a recent discussion on solar cycle, a paper someone can recommend? I kind of answered my own question in #17 after working with the data myself. It is amazing how well the Southern Oscillation Index (from NCAR) fits to a temperature record such as GISS, and only shows deviations in recent years during the big volcanic disturbances. From this one index and the sporadic volcano data which temporarily suppresses the temperature, all recent natural variability seems to be accounted for and all that is left is an upward warming trend. Now I understand why Stefan and Tamino’s work is so straightforwardly practical. No. You are looking at only the top 700 metres of ocean. The North Pacific and North Atlantic subtropical ocean gyres are surface intensified, i.e. they don’t reach down as deep into the ocean as the southern hemisphere gyres. Contrary to your claim, most of the deep ocean warming is actually taking place in the southern hemisphere. See Roemmich & Gilson (2009) and an earlier paper by Josh Willis (I don’t have the details to hand). @38 – “It is of interest to know if Ocean heat Content is different in different oceans or parts thereof“. Well it certainly should be. As shown in Levitus (2012) most of the warming is beneath the subtropical ocean gyres. This is to be expected because the spin-up of the wind-driven ocean circulation speeds up the currents (Ekman transport) which carry heat out of the tropics in the near-surface layers toward the subtropical ocean gyres. Where the poleward & equatorward currents of this intensified circulation converge – the centre of the gyres – surface water is pumped downwards into the ocean interior in a process known as Ekman pumping. The downward flow is (partly)balanced by upward flow near the equator (Ekman suction). That’s largely why the central and eastern Pacific Ocean are cooler-than-average during La Nina – cold water is drawn up from deeper layers below, warm water is pushed down below surface in the western tropical Pacific, and the poleward (meridional)heat transport in the surface layers intensifies. There are no hard and fast rules, but often when the wind-driven circulation spins up, as it is now, El Nino tends to be weaker. It’s complicated, but it may be easier to think of this phase of the circulation as La Nina-like. A far more interesting question is how strong El Nino will be in the future when this circulation becomes sluggish again, i.e. when we get an El Nino and the circulation is El Nino-like. The 1980’s and 1990’s El Nino were certainly much stronger when the circulation was weak, but there is the added complication of global brightening during that period. Without access to Abraham et al. 2013, i must ask if there is a discussion of it somewhere? Regarding those having troubles with the calculations: http://www.wolframalpha.com/ is an excellent resource. If the atmosphere accounts for only 2% of the energy, why are we so preoccupied with the global average temperature? A question: the article leaves one with the impression that when (not if) there is a return to some strong El Niño events that surface temperature averages will resume their rise. Is it not the case that if the relative lack of El Niño’s and predominance of La Nina’s is in fact due to global warming, rather than natural variability, then the current increase in the rate of warming of the ocean below 700m may continue. If this is the case then this may result in a long term reduction in the rate of warming of land and surface ocean temperatures. So, although the science isn’t ‘wrong’ regarding the continued heating of the earth (net energy imbalance), the rate of rise of surface temperatures may prove to be much less than predicted by the models. Not much help though with sea level rise due to thermal expansion! The world awaits the shift of prevailing wind patterns across the equatorial Pacific to deliver a mean El Nino punch. If the increased increasing energy is being distributed in the deep ocean, how does it get out into the troposphere?